LAZY F BAR OUTFITTERS has been providing quality-hunting trips since 1953. Our family has been in the area since the early 1900’s and has hunted the surrounding area since then. Our hunts take place in units 54,55 & 66, on the Gunnison National Forest, and Bureau of Land Management Land. Our large permitted area provides our clients with a tremendous amount of quality areas to hunt. Our family pride shows in our experienced & professional guides, our base and spike camps, our home cooked meals, as well as our experienced and well maintained horses and equipment. Our outfit takes a sincere interest in our clients and their well being. Our base camp is located on the South side of Mount Crested Butte and is accessible by vehicle. Once in camp our clients will enjoy a nice log lodge for accommodations. All meals will be enjoyed in our full service restaurant, two hot meals a day and a sack lunch will be provided for the day out hunting. Colorado’s primitive weapons seasons provide some of the best opportunity available in today’s hunting world. Archery seasons begin the last Saturday of August and continues until late September. This provides many opportunities for today’s archer. With such a liberal season, clients may choose to hunt the pre-rut for Mature bulls, seeking to build their harem or later in the rut when bulls have established their harems and breeding grounds. The areas we hunt have a four point of better restriction on bulls and because of this we are seeing and harvesting more mature animals every year. Mule deer hunters will enjoy breathtaking views above timberline chasing bachelor groups of trophy mule deer bucks. Blackpowder hunters will hunt during the middle of September with cool evenings and warm days. Providing them with tremendous opportunities during the rut. Both archery and blackpowder hunters will experience a one on one hunt. Just you and your guide seeking out a bugling bull or a giant mossback muley. We host a very limited number of clients each week to insure a quality hunting experience for all of our clients. Colorado’s season structure offers rifle hunters many different opportunities to choose from. Our first and fourth hunt is a limited elk season only. Then there are two combined deer, elk and bear seasons. These hunts start the second Saturday in October and continue until approximately mid November. This season structure allows hunters to choose between the late rut hunt and the late season when bulls are breaking away from their cows. These hunts take place between 10,000 feet elevation and 12,000 feet. Our clients will experience several different methods of hunting: Spot and stalk, stand hunting, and drives. All of our clients will be outfitted with their own horse and saddle. Horses are an integral part of our operation. We use them to get us into the high country and to pack game. Although the better physical shape you are in the better opportunity you will have to harvest an animal. 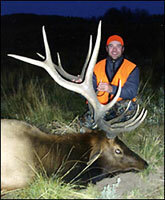 In 1999 Colorado Division of Wildlife limited all deer licenses throughout the state. Currently obtaining a deer license is difficult, but because of the limitations we are harvesting some tremendous bucks. Over the last 12 years we have harvested bucks that score from 160-250 B&C and are 22-35 inches wide. The Gunnison Country is historic mule deer country and some monster bucks have been harvested in the areas we hunt. With limited mule deer licenses and high buck doe ratios, trophy mule deer are no longer a thing of the past. 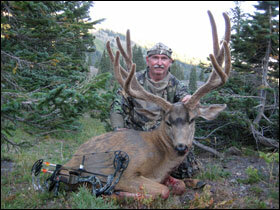 We take pride in finding our clients a trophy mule deer buck. Our guides spend countless hours in the field scouting these bucks, summer, fall and winter. You will not find a more dedicated group of mule deer guides anywhere. 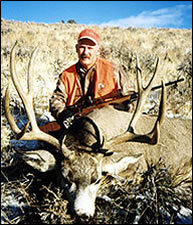 Whether you are a rifle hunter, archer or muzzle hunter, we will work hard to put you on a trophy mule deer. LAZY F BAR OUTFITTERS, INC. 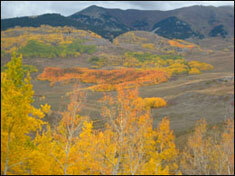 OPERATES UNDER SPECIAL USE PERMIT FROM THE UNITED STATES FOREST SERVICE ON THE GUNNISON NATIONAL FOREST. PERMIT #188. LAZY F BAR OUTFITTERS, INC. IS AN EQUAL OPPORTUNITY EMPLOYER.